To read all patient stories, click here. "You've gotta be kidding me." Charlie Skemp didn't think it was a heart attack. After all, heart attacks happen to other people, not to a healthy 56-year-old who eats right and works out regularly. Still, Skemp admits something didn't seem quite right that morning in March 2015. Click here to read Charlie's story. "I just couldn't get any air," says Clarence Salow, 84, of Earville, Iowa. The Korean War veteran and retired John Deere employee shifts his gaze to the picture window behind his wife as he recalls that Sunday this past February. "That was the real battle; just trying to breathe." Read Clarence's story. After a successful bypass surgery in 1980, the Earlville resident and Korean War veteran went back to work and continued everyday life as a husband and father; that is until February of 2015. 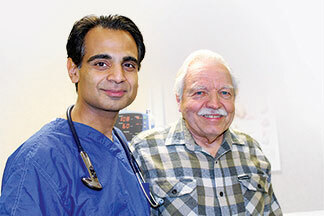 Three decades later, Salow experienced yet another heart attack, this time requiring him to undergo an atherectomy procedure with UnityPoint Clinic® Cardiologist Tauseef Khan, MD, at Finley Hospital. Click here to read more. At the Finley Hospital Cardiac Catheterization Lab a new procedure is quietly changing the way surgeons treat the cardiac patients. For heart-catheterization procedures in the United States, cardiologists traditionally access the heart at the groin. While highly successful, this approach has drawbacks: it leaves the patient relatively immobile for several hours following the surgery, and it includes a very small but measurable complication risk. Currently, 95 percent of all such procedures are performed the traditional way. Read more here. Jim Wilhelm from Dyersville, Iowa,would tell you that his two heart catheterizations were as different as night and day. To learn why, click here.